Formed in 2006, Tamikrest are from Kidal, a remote desert town in the northwest of the Sahara, some 2,000 kilometres north of the Malian capital Bamako. 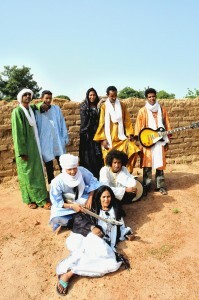 The band members are all Tuareg, a group of people spread over North West Africa from Niger to Mali, Algeria and Libya. After a bloody civil war with the Malian government in the 1990’s, many Tuareg fighters traded their Kalashnikovs and hand grenades for guitars and microphones. From this tradition the distinctive Tuareg sound was born, spawning the mighty Tinariwen and, in turn, Tamikrest. In 2013 the band toured the UK with the hugey successful Sahara Soul tour which played a sold out Barbcan Concert Hall, Celtic Connections and La Gaite Lyrique Paris. Tamikrest will play Womad and Latitude Festivals in the UK in Summer 2013 before releasing their third album in September and touring the UK in October 2013. For many, Tamikrest are the future of Tuareg music, with a sound both authentic and progressive.